Heyyy pretty people of the world wide web. We hope your week is going as well as ours. This week we received our DIYVA by Barbara K Ultimate Tool Kit in the mail!!! This tool kit is seriously the bees knees (do people still say that? What evs, we like it). It includes 25 pink ergonomically designed tools, made specifically for women. When we first held the hammer we noticed a HUGE difference in the look and feel of it, compared to the hammers we own. The tools are lighter than “normal” tools, but somehow more efficient. We have really small hands (weird, we know), so the mini screwdrivers are perfect for us. The tape measure does this neat thing where is DOESNT snap back at you and cute your face, nose, finger, etc. Overall the kit has everything we need for home improvement projects. The fact that the tools are pink are just the cherry on top of the cake. Check out Barbara K’s website & Facebook Page. The DIYVA Toolkit will be in Home Depot stores soon! After we received our kit we knew we HAD to make something amazing, using our awesome pink tools. 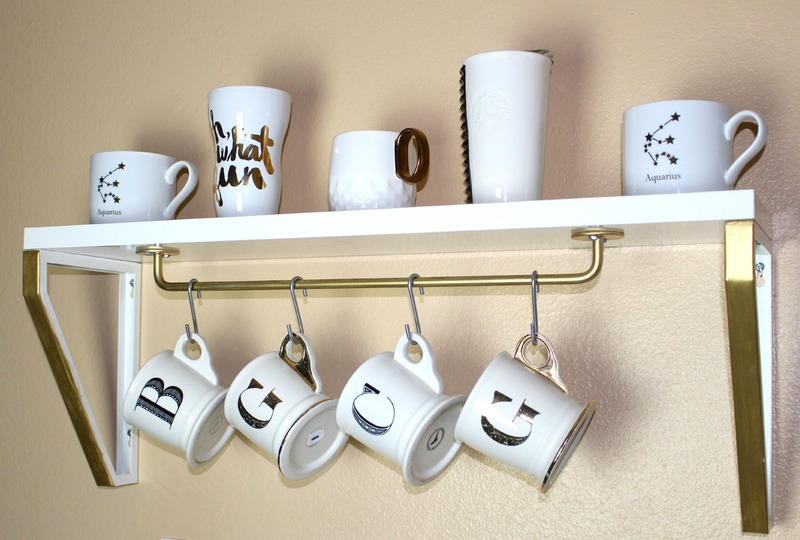 We have been meaning to do something about our coffee mugs for quite some time. Like most women, we are fixated on buying coffee cups. People think buying makeup or shoes can get addicting? Well maybe take a look at your coffee mug collection, because guess what? You really only need like ONE. The sad thing is we rarely drink coffee at home anymore (workin’ that 9-5), so why do we need so many? Well coffee mugs serve as home decor too. So there. Thats our excuse. We knew we needed to make something to store our coffee mugs. Something that could go above our existing glassware shelf. Since we don’t have a whole lot of space we knew we needed to make a space saving contraption, that would still look stylish. So here we go, feast your eyes on our coffee mug shelf! We’re going to walk you through it…. First things first. Get the painting done. Spray one coat of primer on the rail. Let sit for 24 hours. Spray 1-2 coats of the gold spray paint on the rail. Let sit for 24 hours. Use your metallic gold paint and paint the front side of both brackets. You can spray paint the brackets if you’d like. We just thought that was an unnecessary step, and we like the textured look of the acrylic paint. We only painted the front (use painters tape if you are using a larger brush. to make sure you stay “in the lines”) because thats the only part that really shoes, and we didn’t want the white to disappear altogether. Drill the brackets into the shelf- Mark where you want each screw to go FIRST, then drill the screws in, almost all the way. There will be 2 screws on each bracket. Make sure to mark in the small space of the screw hole, not the big one, as thats where your screws will end up. Place each bracket over the screws, and drill the rest of the way. You really need to make sure your marks are where you want the screws to be, since you can’t unmake a hole. We placed our brackets all the way at each end. The bracket will need to hang off the back of the shelf just a little bit, so it’s flat up against the wall. Attach the rail to the shelf- Place your rail in the center of your shelf, in between the brackets, and mark where the screws need to go. There will be four total. You may want to use your measuring tape to find the exact center of the shelf. Hang the shelf- First find the stud in the wall. Its always best to drill into the stud. Even if just one end of your shelf is in the stud, its better than none. But make sure to buy anchors with your screws just in case you need to hang it on drywall. Have someone hold the shelf where you want it, and place the level on top. Once its level mark the four holes where the screws will go (two on each side again). Drill the screws into the wall, almost all the way. Hang your shelf on top the screws, and drill the screws in all the way. 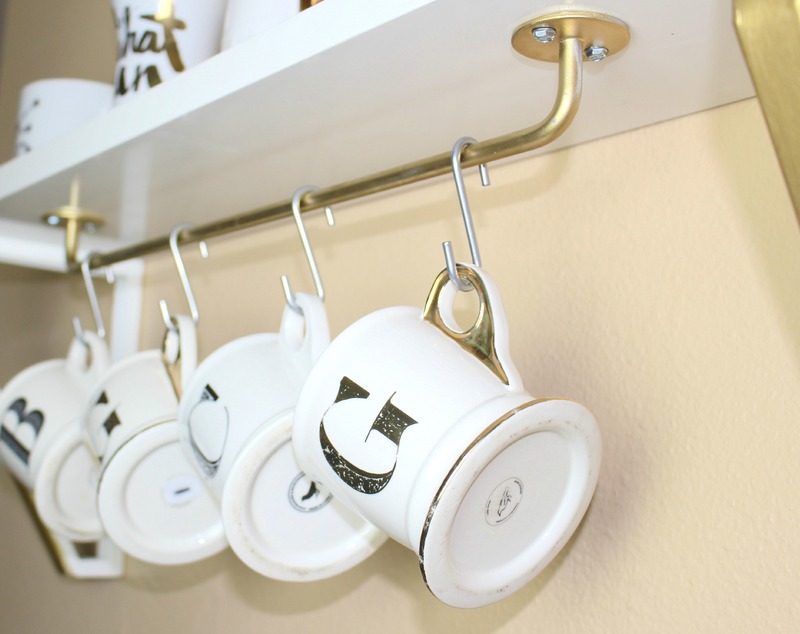 Decorate with coffee mugs-Using the S-hooks hang some coffee mugs on the rail. The rest can go on top of the the shelf. Super cute! I love your DIYs!!! !